A U.S. District Judge said Friday that the $8 million in damages Apple has to pay to patent licensing company Personal Audio for violations of a playlist patent from the iPod covers "past and future use of the technology" and should extend to the iPhone and iPad. 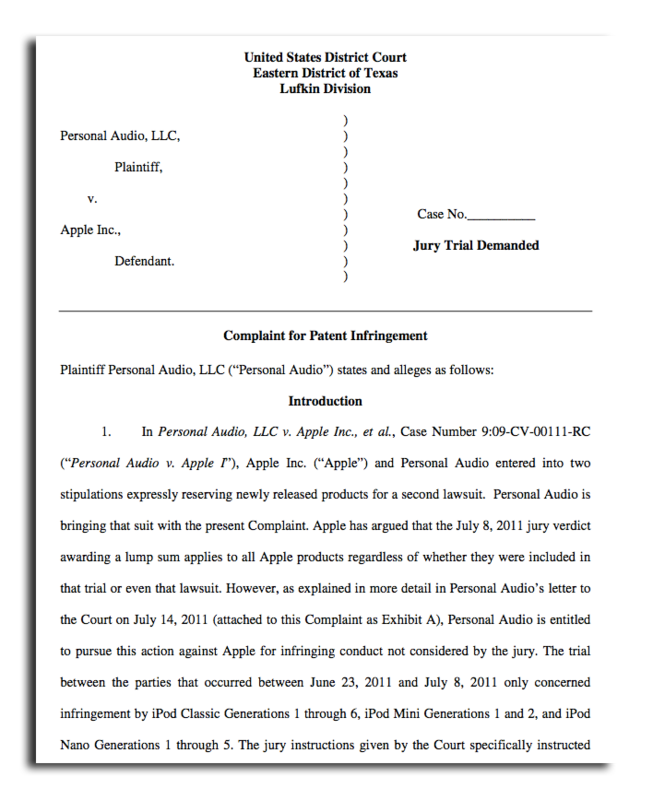 Apple was ordered by the U.S. District Court in Eastern Texas early this month to pay damages to Personal Audio. Within weeks, the non-practicing entity had filed a second suit seeking damages for alleged infringement of Apple's iPhones and iPads, which had not been included in the original suit. Personal Audio had reasserted U.S. Patent No. 6,199,076, entitled "Audio Program Player Including a Dynamic Program Selection Controller," in its second suit. But, Bloomberg reports that District Judge Ron Clark decided on Friday that Apple's $8 million in damages would provide a license for products not specifically named in the original complaint. The court finds that the jurys selection of lump sum as the appropriate form of reasonable royalty clearly represents a damages award giving Apple a fully paid up license that covers all past and future use of the patented technology, Clark said. Filed in 2009, Personal Audio's original suit had asked for $84 million in damages and also accused Sirius XM Radio, Coby Electronics and Archos of violating its patents. The complaint was filed in East Texas, which is known for making quick and favorable decisions for patent holders. Recent job postings discovered by AppleInsider reveal that Apple is looking for reinforcements for its legal team. In addition to disputes with non-practicing entities such as Personal Audio and Lodsys, Apple is currently locked in fierce patent-related legal battles with several competitors, including HTC and Samsung.